The Bureau of Economic Analysis (BEA) revised Q2 GDP to a 4.07464% continuously compounded annual rate from 4.13987%. 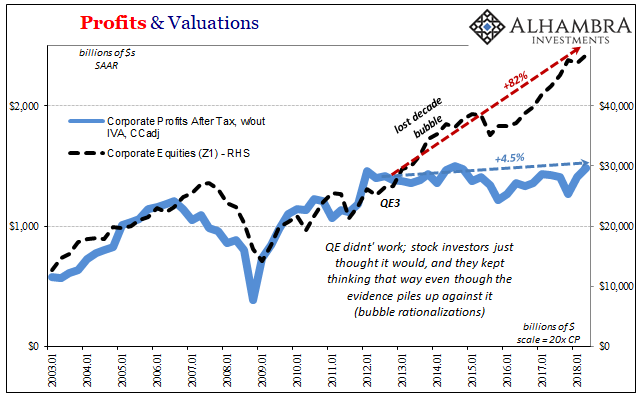 More importantly, the BEA provided revised benchmark estimates for corporate profits. The good news is that the benchmark was higher. The bad news is that companies still aren’t making any money. All the revisions applied to long ago years (2008 and 2009 wasn’t as bad as they thought last year). 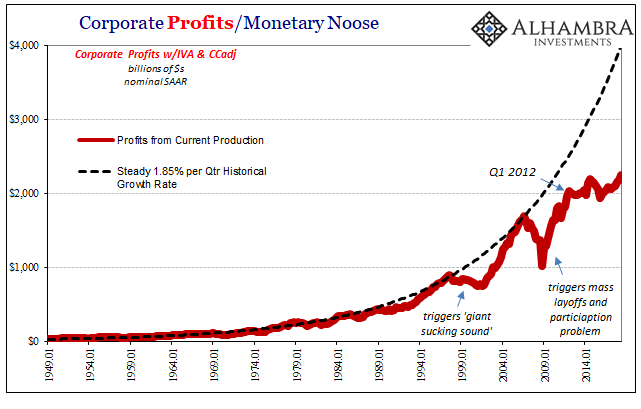 Corporate profits are Exhibit A for why the economy can’t grow. Can’t, not won’t. 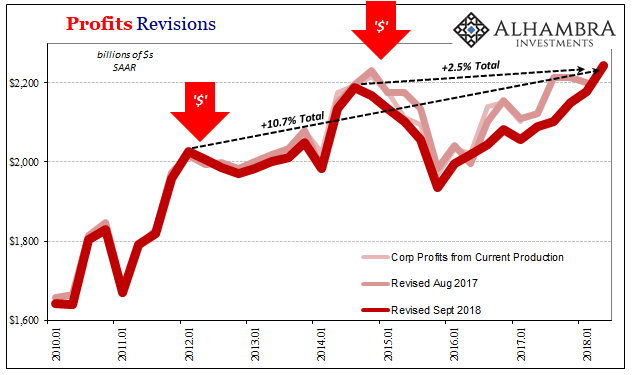 Since the 2011 crisis, eurodollar event #2, the one that proved fatal to any chance at monetary therefore economic recovery, corporate profits are up all of 1.3%. Total. Not per year. The benchmark revisions also reshaped the last eurodollar event, too. 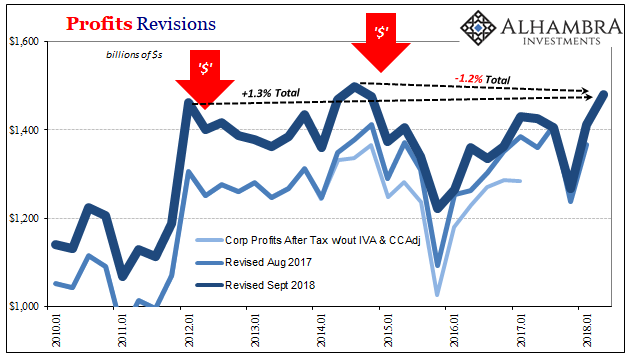 They now place the start of the earnings recession in Q4 2014 rather than Q1 2015; more consistent with the “dollar’s” behavior and the economic reaction to it. Though profitability has rebounded since, it really hasn’t. 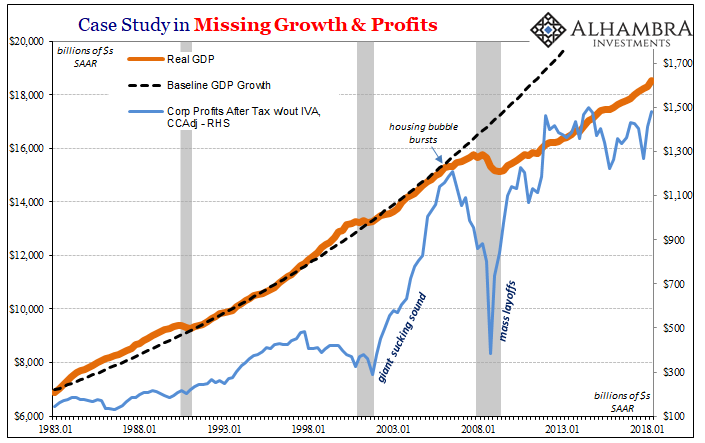 Profits by this measure are still slightly less than the re-dated prior peak. Circumstances are only marginally better in other profit series, which is to say they agree on the overall situation if differ as to the degree of sheer economic degradation. Profits from Current Production, for example, have risen by nearly 11% since the start of 2012 as compared to the other series’ 1.3% gain. It’s a difference of 1.6% per year versus 0.2%. I doubt corporate boardrooms see that as meaningful. The symptoms of this dysfunction are obvious. Companies that can’t grow on the bottom line are going to overmanage their cost structures. Throw in lingering skittishness about liquidity and they just aren’t going to be enthusiastic about taking on further cash flow liabilities; those like paying a lot for additional labor that doesn’t appear to be necessary. Companies can’t make any money because the economy isn’t growing, and the economy can’t grow because companies can’t make any money. 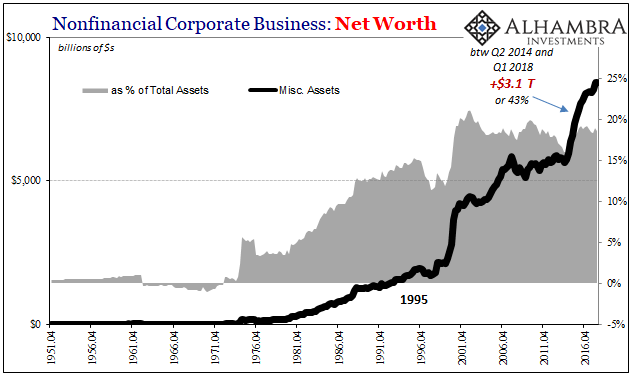 It only seems like a chicken and egg problem from the perspective of QE and the current orthodoxy of central bankers. 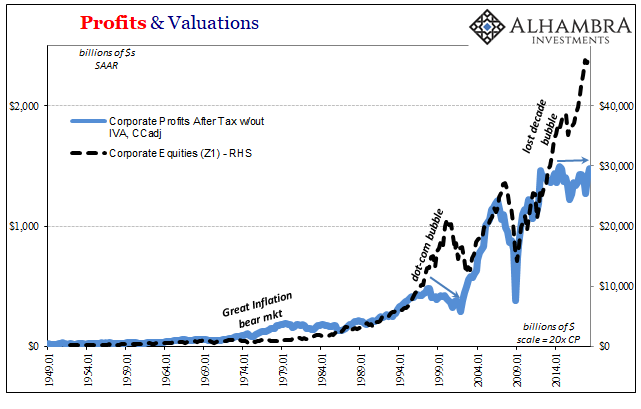 The other symptom of profit stagnation is stock market valuations. Investors are rewarding companies for doing the wrong thing. Share prices surged especially after QE4 (they initially declined after QE3, which would’ve been the correct reaction given how things have turned out had it continued) anticipating that the Federal Reserve along with the ECB and BoJ were collectively going to figure all this out. In the aggregate, the market value of stock holdings has surged by more than 80% since Q3 2012. Profits are up not even 5%. The current data suggests that there is no more upside than this. The lethargy is very well established by now, to say nothing of dealing with another prospective downturn looming now over the horizon as the dollar awakens for another turn. Faced with these prospects, what would you do as a corporate officer? Markets are thought to be rational and this is one of the few cases where stocks appear to be just that – on the corporate side. Investors are clearly rewarding economic suicide, therefore corporate boards are aiding in that suicide because they have no realistic alternative. Why invest in productive business when there is no economic upside to it? At least you will get paid at the NYSE off the widespread misunderstanding of QE. After botching 2008 so badly, central banks found themselves constrained by their own failures. They call it the zero lower bound, the fact that nominal rates can’t be negative, but it was really the “we screwed up so badly we have to resort to different tactics” boundary. QE was presented as a way to circumvent the nominal limitation by playing on misconceptions about money. By allowing people to think it was money printing, this would raise expectations for future inflation. Economists theorized this was a good thing; consumers would move up and even increase current spending expecting that prices would rise in the near future because of the money printing. Businesses were supposed to react the same way; increase their activities including hiring and capex anticipating greater costs for them. What if you are a business who has been liquidity constrained, or even just nervous because of your 2008 experience? Inflation expectations are at best counterproductive. You will instead wait for the opportunity to show itself before you actually do something this time. 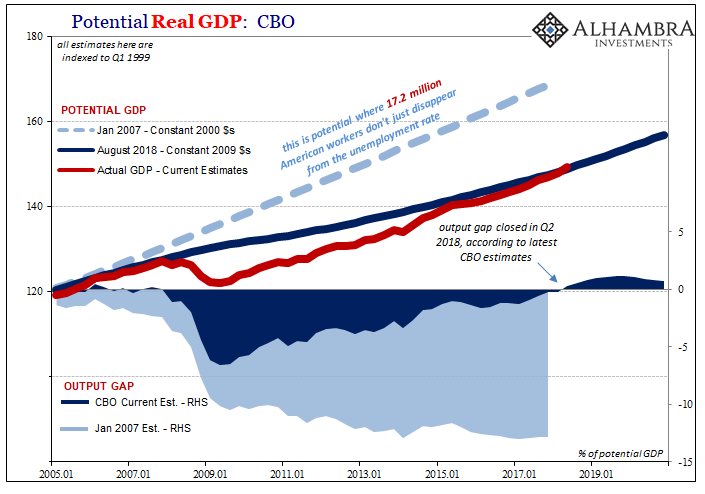 QE can’t work until it actually works. The Fed says it’s going to fix the economy and that will raise future costs. Fine. But I’m not going to invest and take on a whole bunch of current risk, incurring those futures costs today, until I see it first. 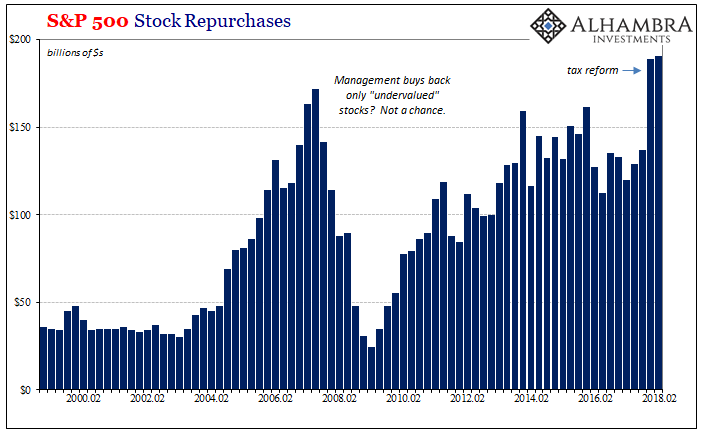 In the meantime, I’ll just buyback shares or buy some of my competitors while I wait for the Fed’s latest scheme to finally payoff. If it ever does. So far, it hasn’t and many inside corporations know that it won’t. Stock investors meanwhile just keep expecting that at some point it will just kick in. And round and round we go nowhere.